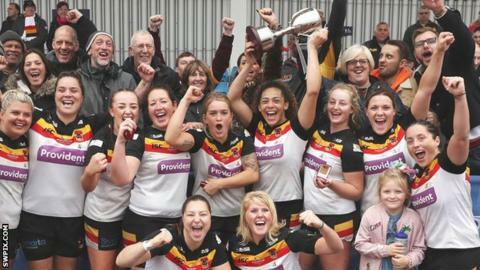 Bradford Bulls beat Featherstone Rovers 36-6 to win the inaugural Women's Super League Grand Final and complete a league and cup double. Tries from captain Kirsty Moroney and Lois Forsell put Bulls ahead before Georgia Roche replied for Rovers. Charlotte Booth went over to give Bradford a 16-6 lead in Manchester. Second-half scores from Claire Garner, who also kicked fours goals, Amy Hardcastle, Charlene Henegan and Haylie Hields ensured victory. Bradford won the Challenge Cup this season and finished the campaign with a 100% record across all competitions. "It's sloppy conditions so we didn't play how we've been playing all season, but we still got the win," Moroney said. "We set out to win some silverware but we didn't think in our wildest dreams we would go unbeaten." Castleford Tigers and Leeds Rhinos meet in the men's Grand Final at Old Trafford at 18:00 BST.